Preheat your oven to 180'C / 350'F /Gas 4. In a medium bowl cream together the dairy-free margarine, lard and sugar until light and fluffy. Then beat in the half an egg and vanilla extract or almond essence. Sift together the gluten-free flour, gluten-free baking powder and xanthan gum, then stir into the creamed mixture with a wooden spoon until well mixed. Roll in to balls about the size of a walnut, then toss in the desiccated coconut or gluten-free oats. Place on the prepared baking trays and slightly flatten with the tips of your fingers. 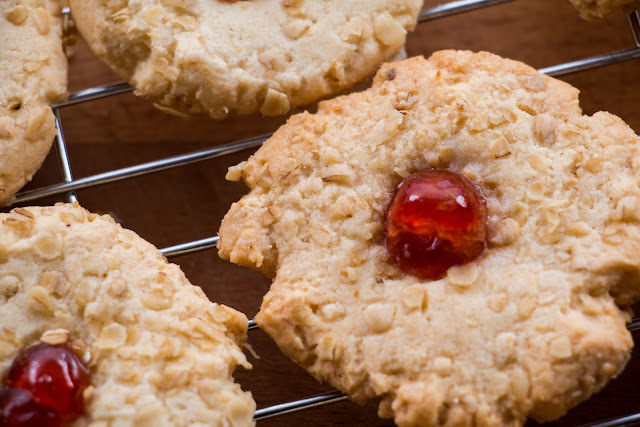 Place half a glacé cherry on each biscuit, pressing it down slightly. Bake for 10-12 minutes until just turning golden. Allow to cool for 10 minutes on the trays then carefully lift on to a cooling rack.